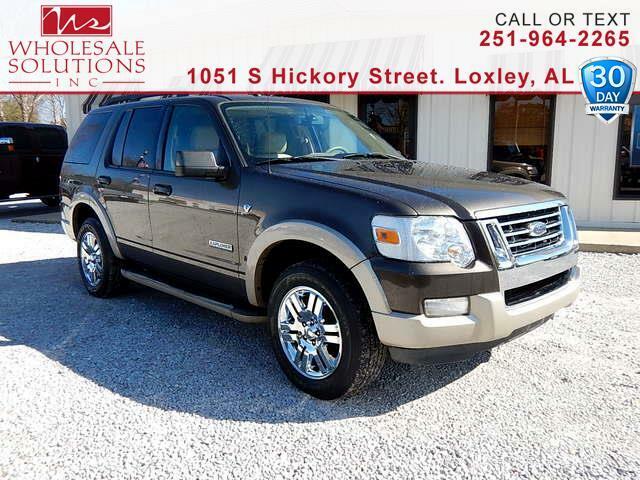 Used 2008 Ford Explorer Eddie Bauer 4.6L 2WD for Sale in Loxley AL 36551 Wholesale Solutions Inc.
3rd Row Seats, ** Clean **, *** DEALER WARRANTY ***, DVD Player, *** Low Payments ***, Sunroof, Alloy wheels, Dual Zone Electronic Temperature, Eddie Bauer Luxury Package, Front fog lights, Heated Exterior Mirrors, HomeLink, Leather-Trimmed Low-Back Sport Buckets, Leather-Trimmed Low-Back Sport Buckets w/96E, Mini Overhead Console, Power Adjustable Pedals w/Memory, Power door mirrors, Power Moonroof w/Shade, Rear-Seat DVD Entertainment System. Odometer is 8855 miles below market average! Priced below KBB Fair Purchase Price! Clean CARFAX.